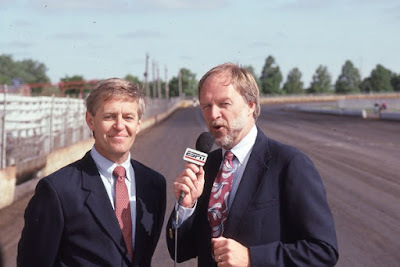 This is the famous announcer, commentator, TV host and AMA Hall of Famer, Dave Despain interviewing Ricky Graham, and below with Harley-Davidson tuner and team boss (and later Kawasaki ER6/ Ninja 650 pioneer), Bill Werner. Dave has contributed a story for the next Sideburn. 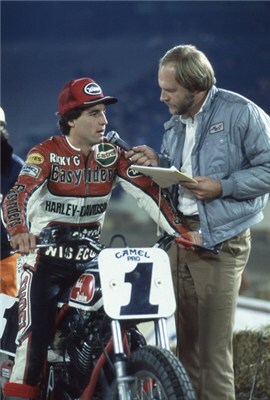 I was lucky enough to come up during the time that Dave was the AMA flat track announcer. Kinda like the sound of the Honda Z50 I rode at the time, the sound of his voice means 2-wheeled sport to me.